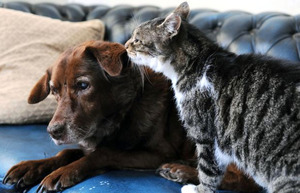 A blind dog from Wales is up and moving again thanks to his new buddy — a stray cat turned Seeing Eye companion. Terfel’s outlook on life changed drastically the day that his owner, Judy Godfrey-Brown of Holyhead, North Wales, took in a small stray cat. Godfrey-Brown has since named the cat Pwditat — pronounced “Puddy-Tat,” like what Looney Tunes canary Tweety Bird calls cartoon cat Sylvester. When he met Pwditat, Terfel, who had barely left the safety of his basket for months, instantly took to the new houseguest. Godfrey-Brown could hardly believe her eyes as she watched the little cat gently lead Terfel around the garden. It was as if the cat sensed Terfel’s condition and knew instinctively that the blind pup needed a friend (see video). But not these two. Pwditat and Terfel became fast friends, and the pair spends their days taking walks around the yard or snuggling inside the house. “Pwditat immediately seemed to know that Terfel is blind through some sort of sixth sense that animals have,” Godfrey-Brown explained in a Daily Mail interview. Amazed at Terfel’s progress and grateful for the cat’s healing presence, Godfrey-Brown decided to permanently adopt Pwditat. Friend Anne Craig has since taken over care of Terfel and Pwditat while Godfrey-Brown is hospitalized with an illness. Even upon first meeting them, Craig could see right away that her friend’s cat and dog share an unbreakable bond.